A medium-spiced, tandoori paste with yoghurt, a tandoori seasoning mix and mint chutney in individual pouches. And with no nasties. Chilli rating - medium - 2. Serves 2 as a main. Low on fuss, huge on flavour! Paste your food > roast, grill or BBQ > sprinkle over spices > serve with chutni. No artificial preservatives, flavourings or colourings. Suitable for vegetarians. Our easy and delicious tandoori pastes are beautifully flavoured so you can roast, grill or BBQ to succulent perfection. Cover meat, fish, veg, tofu or paneer and roast, grill or BBQ with this versatile paste. Dust with tandoori seasoning and then dunk in the cool mint chutni. Our Spicy Tandoori paste is a harmonious blend of yoghurt, ginger, garlic, and warming spices, with an added kick and appetising smokiness. 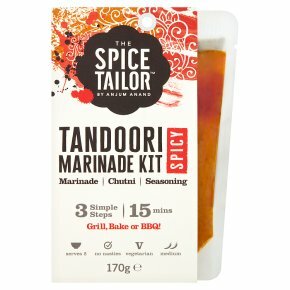 Anjum x Introducing... Fast Paste Spice up mealtimes with our new range of tandoori pastes. Ideal for easy, healthy mid-week meals, to amp up a salad, as a side dish or to share with friends as a starter. Fast food has never been tastier! Spice Up Your Supper It's so versatile, it always delivers. There's never been a better time to play with your food! Cauliflower Toss bite-sized florets into the paste & bake for 25 mins or until cooked. Chicken Marinate chunks of 4 small chicken thighs for as long as possible. Bake for 8-10 mins or until cooked. Fish Coat 2 large firm, thick, white fish fillets and bake for 10-12 mins. Paneer Coat pieces of paneer, pepper and red onion in the paste adding 2 tbsp each of water and oil. Skewer and bake for 10 minutes or until cooked and charred in places. Lamb Marinate chunks of lamb for as long as possible. Roast for 25 mins until very tender (the Indian way) or 8-10 mins for medium-rare. For Perfect Results: Always preheat your oven and cook the above at 200°C. Cut your ingredients into equal, medium-sized pieces. Make sure your ingredients are at room temperature. For extra succulence, baste the meat/fish with any juices that escape and rest, covered, for 10 mins once done. For some BBQ-style char, flash the almost finished ingredients under a grill for 1-2 mins. Check the inner temperatures of red and white meat to ensure they are cooked through. Tailor to Taste ready... set... Spice! Add another dimension by sprinkling over this amazing spice seasoning blend. It adds zing, warmth, flavour and honestly, a little magic to your food! Cook in 4 Simple Steps... 1. Stir 1 tbsp of oil (or 2 for paneer) into the paste, and coat your favourite meat, fish, paneer or veg. 2. Roast, grill or BBQ 3. Sprinkle over our delicious speedy tandoori seasoning to taste. 4. Stir 1 tbsp plain yoghurt into the mint chutni ...and serve. Not suitable for microwave use.